Hiking is an activity the entire family can enjoy together. In Lake Tahoe, you can stroll down the beach or test your lung capacity with a thigh burner up a mountain. You will end up with breath taking views and a variety of difficulty. Hiking alone is the basis for many a love affair with Lake Tahoe from young and old. Explore a little, over 80% of the Lake Tahoe Basin is public land. Summer is crowded, so arrive early. Dogs must be on a leash at all times. Take Hwy 89 north approximately 3 miles from South Lake Tahoe to Fallen Leaf Lake Rd. and turn left. Turn left at the first paved road. Continue to Forest Service Rd. 12N14 and turn right. Watch for bicyclists along this road. Continue past Angora Lookout to the road`s end at the parking lot. Enjoy the lemonade. Spectacular views of the 200 foot high falls and Cascade Lake can be seen from this short trail. Take Hwy 89 north from South Lake Tahoe approximately 8 miles to the Bayview Campground across from Inspiration Point. Parking is located at the far end of the campground. Offers the most breathtaking views of the lake, the mountains, and Tahoe`s only island - Fannette Island. Both of these parks have campgrounds, opportunities for hiking, swimming, fishing, and interpretive activities. The D.L. Bliss State Park has a wonderful beach on Rubicon Bay which is also a trailhead for the Rubicon Point Trail that continues to Vikingsholm Castle- the most popular attraction on the west end of Emerald Bay. The castle is considered the finest example of Scandinavian architecture in the United States and is open for guided tours during the summer months. 63,475-acre wilderness area with hundreds of glacial lakes, sub-Alpine forests, valleys and granite peaks. Visitors will find Desolation in its natural form and on its own terms - meaning sudden storms, fires and other hazards may be encountered. Required wilderness permits can be obtained and self-issued at most of the trailheads for day hikes, or at U.S. Forest Service offices on the South Shore of Lake Tahoe for overnights. Call (530) 543-2600, or (530) 543-2674 for more information. Leading into the heart of Desolation Wilderness, this steep trail offers majestic views of the Sierra high country. Take Hwy 89 north approximately 8 miles from South Lake Tahoe to Eagle Falls Picnic Area on the left. Wilderness permit required. See a variety of alpine lakes on this moderate trail. Take Hwy 50 to Echo Summit and turn onto Johnson Pass Road. Stay left and the road will lead you to the parking area by Lower Echo Lake. Take Hwy 89 north approximately 3 miles from South Lake Tahoe to Fallen Leaf Lake Road. Watch for bicyclists and cars on this narrow, one-lane road. Continue until you see the Glen Alpine trailhead sign and turn left. Trailhead parking is across from Lily Lake. Wilderness permit required. Grover Hot Springs State Park is located on the east side of the Sierra at the edge of the Great Basin Province, characterized by open pine forest, and sagebrush and meadows. The park has a pool complex with a hot pool and a swimming pool hot springs, a campground, picnic area and hiking trails. Located four miles west of Markleeville, at the end of Hot Springs Road, the park is at 5,900 feet surrounded by peaks that just top 10,000 feet. A must for the kids. LOTSA is an adventure programming company based out of the South Lake Tahoe basin. We have programs for both teens and adults, including; multi-activity programs, dirt camps, bouldering camps, foothills cycling tours, avalanche classes, and backcountry ski clinics. Lam Watah Nature Trail is a 1.5 mile scenic walk through meadows and woods to Nevada Beach. Trailhead is near Stateline at Hwy 50 and Kahle Drive. Park at the Spooner Lake Trailhead, located in Lake Tahoe Nevada State Park, just northwest of the Hwy 50/28 junction. A parking fee is charged. Dogs are allowed on leash. Stroll along a relatively flat trail through the forest and along the shore of picturesque Fallen Leaf Lake. Take Hwy 89 north approximately 3 miles from South Lake Tahoe to Fallen Leaf Road. Continue approximately 2/3 of a mile to Fallen Leaf Campground. Drive through the campground and park just before campsite #75 on the right. There is no fee for day use. Look for the trailhead sign near the parking area. In the winter when the campground is closed, you must park just beyond Fallen Leaf Campground off of Fallen Leaf Lake Road and walk to the trailhead. Providing a spectacular view of Fallen Leaf Lake, Lake Tahoe and Desolation Wilderness, this strenuous hike is well worth the effort. The trailhead is located north of South Lake Tahoe on Hwy 89. Look for Mt. Tallac Trailhead sign directly across from the entrance to Baldwin Beach and turn left down the dirt road. Continue to the trailhead parking. A wilderness permit required. From Mexico to Canada the PCT boasts the greatest elevation changes of any of America`s National Scenic Trails. Summer and Winter activities include mountain bike riding, fly fishing, hiking, fishing, workshops of all kinds. 165 mile trail, open to hikers, equestrians, and in some areas to mountain bikers. The trail encompasses the ridge tops of the Lake Tahoe Basin. Elevation on the trail ranges from 6,300 to 10,333 feet. The Pacific Crest Trail and TRT combine on the west side of the Tahoe Basin. The TRT can be accessed from 12 different trailheads around the lake. Step back into the past and explore the personalities, events and summer homes of turn-of-the-century Tahoe landowners. The trail begins from the Kiva Picnic Area and is accessible to persons with disabilities. The site can also be reached from the Lake of the Sky Trail that begins at the Lake Tahoe Visitor Center. Former site of the 100-year-old Tallac Resort. In its days of glory, the resort included two large hotels, a casino, and numerous annexes and out-buildings. Nowadays, the site is home to Valhalla community events center and its annual Valhalla Festival of Arts and Music. Exhibits on the Baldwin family-the former proprietors of the Tallac Hotel, and on the Washoe Indian Tribe can be seen at the Tallac (Baldwin) Museum located also within the site. Located on Hwy 89 three miles north of South Lake Tahoe offers numerous self-guided trails with award winning signs. An underground chamber features a cut-away of the stream so visitors can view fish behind the glass. Take the 1/2 mile loop on the fully accessible Rainbow Trail to see the chamber. Hike the short trail to Lower Eagle Falls which begins directly across from the castle. Pets are not allowed. Take Hwy 89 north from South Lake Tahoe approximately 9 miles to the parking lot on the right. The parking lot fills up quickly in the summer season, so arrive early. 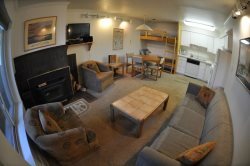 Classic Tahoe-style cabins, lodge rooms, an RV park and campground, lakeview restaurant, espresso bar and general store. Attracting visitors and locals since 1862, Zephyr Cove Resort has a mile of sandy beach, volleyball courts, Beach Bar and Grille, picnic tables, bbq pits and group areas that welcome up to 2500.